To kick off the NCAA tournament, a couple of us headed out to find lunch, beverages, and the games on TV. Fortunately, we found Anthony’s Coal Oven Pizza not far from the office. While specializing in the “well done” pizza, Anthony’s has a good lunch menu and, more importantly, games on TV, and a full bar. To go with my Paul & Young Ron pizza (meatball, sausage, hot peppers and ricotta cheese), I opted for a Brooklyn Brewery Brown Ale. Appearance: Dark brown with a light, white foam and good lacing. Aroma: Sweet malt with hints of nuts, dried fruit and hops. Taste: Sweet, malty with a hint of hops followed by a smooth, somewhat short, finish. 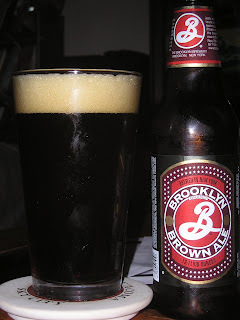 The Brooklyn Brown Ale was a good complement to my pizza. It was so good, in fact, that I had a second one. But, while it was thirst quenching, it was a little on the thin side. I am a big fan of brown ales and measure them against the Samuel Smith Nut Brown Ale. As such, I had expected a bigger, fuller flavor, but the flavor was a little muted, if not, watery. I really like the Brooklyn Brown, though it’s surprisingly tough to find in Pittsburgh. I first had it with a Thai style fried rice which was fantastic. It is a great complement with bold, flavorful food. I hope your search turns up a bottle or two. I really wish I could find this out here in the midwest, watery or not. The abundance of craft beer is one of the benefits of living in the Delaware Valley. And, while not as big and flavorful as some browns it was still a very good beer.